Our hot towels are infused with organic essential oils and then placed on areas of your body, based on your aches and pain. When combined with massage, moist hot towels will produce general relaxation, melt the fascia, help to reduce muscle spasms and pain. 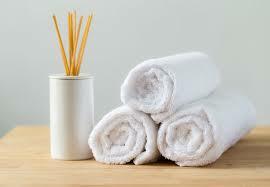 The heat from the towels will loosen and relax the muscles and soothe the aches. It’s a lovely addition to your massage. This treatment is a great way to get a magnesium boost (of which most of us are deficient) while exfoliating the skin and detoxifying the body. Our soothing salt foot scrub combines pure grade Epsom salt with uplifting organic essential oils, apricot oil and coconut oil. The oils moisturize the skin, which the roughness of the salt exfoliates. We then wrap the feet with our essential oil infused hot towels, and finish by massaging the feet with a magnesium rich lotion. It’s a very soothing and relaxing addition.